Artworks above are by: Top row, left to right: Edward Saidi Tingatinga (1932–1972), whose work inspired the Tingatinga painting style and school, Daudi Tingatinga (the son of ES Tingatinga), ES Tingatinga. Middle row: Daudi Tingatinga, ES Tingatinga, ES Tingatinga. Bottom row: Daudi Tingatinga, Mchisa Thabiti, Daudi Tingatinga. Edward Saidi Tingatinga was born to a poor family in a village in southern Tanzania. After making his way to Dar es Salaam, he took a job as a gardener and began experimenting first with music and then with painting. 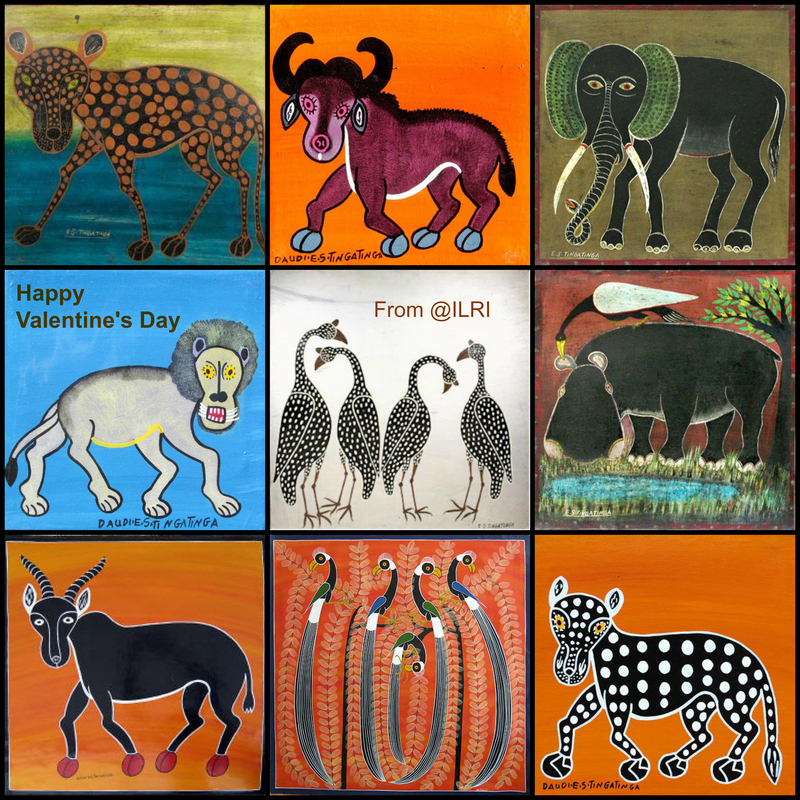 Using recycled, low-cost materials (masonite squares, ceramic fragments, bicycle paint), he painted in a naive style, with most of his subjects Africa wildlife and savannah icons. Check out this collage by ILRI and other great images on the ILRI Flickr site, where you can locate 10,719 images categorized in 381 albums. Tags: collage, Edward Saidi Tingatinga, Valentine's Day. Bookmark the permalink.